2019 ‘The paranoid style of American elections: Explaining misperceptions of electoral integrity in an age of populism’ with Pippa Norris and Holly Ann Garnett. Journal of Elections, Public Opinion and Parties, doi: 10.1080/17457289.2019.1593181. 2019 ‘Does group engagement with members constitute a ‘beneficial inefficiency’?’ with Darren R. Halpin. Governance, DOI: 10.1111/gove.12388. 2019 ‘The Expanding Party Universe: Patterns of Partisan Engagement in Australia and the United Kingdom’ with Anika Gauja. Party Politics, DOI: 10.1177/1354068818823687. 2018 ‘The integrity of elections in Asia: Policy lessons from expert evaluations‘. Asian Politics & Policy, 10(3):527-547. 2018 ‘The ‘Crowd-Factor’ in Collective Action Online: Comparing Protest Communication Styles of Thai Facebook Pages’ with Aim Sinpeng. Journal of Information Technology & Politics, 15(3):197-214. 2017 ‘Domestic Election Monitoring and Advocacy: An Emerging Research Agenda’. Nordic Journal of Human Rights, 35(4)407-423. 2017 ‘Electoral Sources of Authoritarian Resilience in Russia: Varieties of Electoral Malpractice 2007-2016’ with Margarita Zavadskaya and Ferran Martinez i Coma. Demokratizatsiya: The Journal of Post-Soviet Democratization ,25(4), 455-480. 2014 ‘Echo Chambers. Partisan Facebook Groups during the 2014 Thai Election’. Asia Pacific Media Educator, 24(1):1-21. 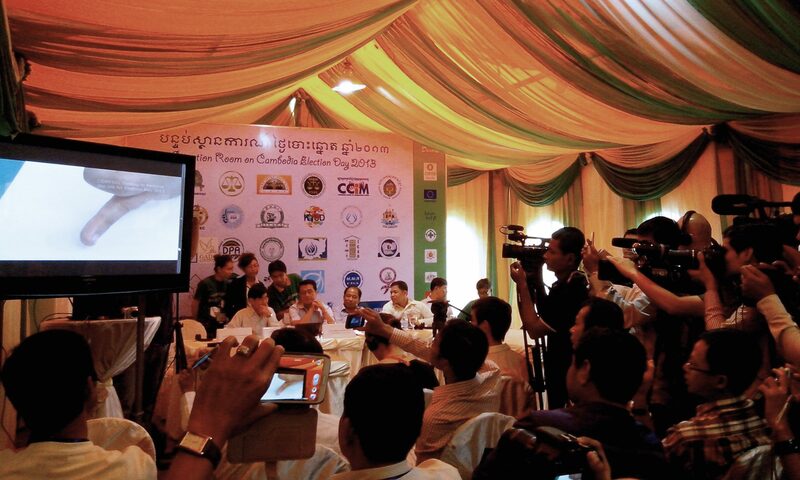 2013 ‘Cambodia’s 2013 Elections: The Retreat of “Electoral Authoritarianism”?‘. SocDem Asia Quarterly, 1(2):13-15. 2017 ‘Domestic monitors’ In Election Watchdogs: Transparency, Accountability, Compliance and Integrity, edited by Pippa Norris and Alessandro Nai, pg. 167-190. New York: Oxford University Press. 2006 ‘Potenziale und Entwicklungshemmnisse der Iranischen Wirtschaft‘ with Joscha Graff. In Die Islamische Republik Iran. Eine Studienreise. Edited by Carsten Felgentreff. Potsdam: Universitätsverlag Potsdam. 2019 Replication Data for: “More Bang for the Buck: Media Freedom and Organizational Strategies in the Agenda-Setting of Human Rights Groups”. Harvard Dataverse, V1, https://doi.org/10.7910/DVN/EA011Q. 2017 Perceptions of Electoral Integrity (PEI_5.5), with Pippa Norris, Thomas Wynter and Sarah M. Cameron. Harvard Dataverse, V1, http://dx.doi.org/10.7910/DVN/EWYTZ7. 2017 Perceptions of Electoral Integrity (PEI_5.0), with Pippa Norris. Harvard Dataverse, V1, http://dx.doi.org/10.7910/DVN/YXUV3W. 2017 Perceptions of Electoral Integrity, US 2016 (PEI_US_1.0), with Pippa Norris, and Alessandro Nai. Harvard Dataverse, V1, http://dx.doi.org/10.7910/DVN/YXUV3W. 2016 Perceptions of Electoral Integrity, (PEI-4.5), with Pippa Norris, Martínez i Coma, and Alessandro Nai. Harvard Dataverse, V3, http://dx.doi.org/10.7910/DVN/LYO57K. 2015 Perceptions of Electoral Integrity-Russia, (PEI-Russia 1.0), with Pippa Norris, Martínez i Coma, and Alessandro Nai. Harvard Dataverse, V1, http://dx.doi.org/10.7910/DVN/8LYUAY. 2015 Perceptions of Electoral Integrity-Mexico, (PEI-Mexico 1.0), with Pippa Norris, Martínez i Coma, and Alessandro Nai. Harvard Dataverse, V1, http://dx.doi.org/10.7910/DVN/O6UCIM. 2019 Book review: ‘How to Rig an Election. By Nic Cheeseman and Brian Klaas. New Haven: Yale University Press, 2018. 320p. $26.00 cloth’. Perspectives on Politics, 17(1), 284-285. doi:10.1017/S153759271800422X. 2019 ‘The Crowdsourced Replication Initiative: Investigating Immigration and Social Policy Preferences. Executive Report’, with Breznau, Nate, Eike Mark Rinke, Alexander Wuttke et al., SocArXiv Papers. DOI: 10.31235/osf.io/6j9qb. 2017 ‘The Year in Elections 2017: Mid-Year Update’, with Pippa Norris, Thomas Wynter and Sarah M. Cameron. October 2017, University of Sydney. 2017 ‘Populist Threats to Electoral Integrity: The Year in Elections, 2016-2017‘, with Pippa Norris. HKS Faculty Research Working Paper Series, RWP17-018. May 2017. Sydney: University of Sydney. 2017 ‘The 2016 American Presidential Election – Perceptions of Electoral Integrity, US 2016 subnational study’, with Pippa Norris and Holly Ann Garnett. January 2017. Sydney: University of Sydney. 2017 ‘The Australian Voter Experience. Trust and confidence in the 2016 federal election’ with Jeffrey Karp, Alessandro Nai, Ferran Martínez i Coma, and Pippa Norris. January 2017. Sydney: University of Sydney. 2015 ‘The Year in Elections, 2014’ with Pippa Norris and Ferran Martínez i Coma. HKS Faculty Research Working Paper Series RWP15-008, February 2015. 2015 ‘Electoral Integrity in Africa‘ with Ferran Martínez i Coma. Sydney/Johannesburg: Electoral Integrity Project / Hanns Seidel Foundation. – The Australian Institute of International Affairs, Sydney, Australia. October 2017. – Université libre de Bruxelles, Brussels, Berlgium. January 2017. – Berlin Social Science Center/ Wissenschaftszentrum Berlin (WZB), Berlin, Germany. December 2016. – European Platform for Democratic Elections (EPDE), Berlin, Germany. December 2015. – Berlin Social Science Center/ Wissenschaftszentrum Berlin (WZB), Berlin, Germany. December 2015. – Electoral Regulation Research Network (ERRN), University of New South Wales, Sydney, Australia. November 2015. – University of Münster, Department of Political Science, Münster, Germany. July 2015. – Asian Electoral Stakeholder Forum II, Dili, Timor-Leste. March 2015. – United Nations Development Program (UNDP) Asia-Pacific Regional Centre, Bangkok, Thailand. January 2015. – University of Western Sydney, School of Humanities and Communication Arts, Sydney, Australia. May 2014. – Thammasat University, Faculty of Political Science, Bangkok, Thailand. August 2013. – University of Canberra, Australia and New Zealand School of Government, Canberra, Australia. October 2014. – German-Southeast Asian Center of Excellence for Public Policy and Good Governance (CPG), Bangkok, Thailand. February 2011. – ‘Why the mistrust? How Elite and Popular Perceptions of Electoral Integrity diverge in Australia‘. 18 May 2017. POP Politics Aus. – ‘Electoral integrity in all 50 US states, ranked by experts‘, with Pippa Norris, and Holly Ann Garnett. 27 December 2016. VOX. – ‘Why don’t more Americans vote? Maybe because they don’t trust U.S. elections‘, with Pippa Norris, and Holly Ann Garnett. 26 December 2016. The Washington Post/Monkey Cage. – ‘‘Failed’ Electoral System Ranked Asia’s Worst‘. 24 September 2016. The Cambodia Daily. – ‘A tale of two elections‘. 17 May 2016. New Mandala. – ‘Watchdogs on a leash: where and why governments restrict election monitors‘. 16 March 2016. The Conversation. – ‘Asian Electoral Stakeholder forum discusses electoral integrity in Asia and beyond‘. 19 April 2015. Electoral Integrity Blogspot. – ‘Southeast Asian elections worst in the world.‘ 15 February 2015. New Mandala. – ‘The ‘Thaksin Regime’ vs. the ‘Good People’‘. 26 December 2014. Asian Correspondent. – ‘Protesters in Thailand invoke Hunger Games three-finger salute to voice dissent‘. 3 June 2014. Sydney Morning Herald. – ‘Electoral integrity in Thailand‘. 1 May 2014. New Mandala. – ‘Voting in Asia: not meaningless charades, but public wants more‘. 18 April 2014. The Conversation. – ‘Malaysia bottom of the pile in global study on electoral boundaries‘. 3 March 2014. The Malay Mail Online. – ‘Election ranks low: study‘. 28 February 2014. Phnom Penh Post. – ‘Derailed election in a divided Thailand‘. 2 February 2014. New Mandala. – ‘Extending a hand or raising a fist to the state?‘. 23 January 2014. Open Security. – ‘Thailand’s opposition rejects elections‘. 30 December 2013. Electoral Integrity Blogspot. – ‘Cambodian civil society keeps an eye on the election amidst widespread irregularities (The 2013 Cambodian Election, Part 2)‘. 28 July 2013. Electoral Integrity Blogspot. – ‘The 2013 Cambodian election, Part 1: The menu of strategic manipulation‘. 25 July 2013. Electoral Integrity Blogspot.